Suffering from a latex allergy can cause a range of symptoms, from itching to having trouble breathing. If you suspect you suffer from a sensitivity to latex, it's important that you find safe alternatives. The WithGarden Luminus 507 Premium Nitrile Herb Patterned Gardening Gloves are an excellent substitute. Just like their latex counterpart, these gloves protect your hands against dirt and water while also improving your grip. This ensures you're able to continue working with the protection you need. Gardening tasks tend to require additional grip in different conditions. Thankfully, these gloves offer excellent grip in both wet and dry settings. This is a result of MicroFinish technology, as explained in the short video below! 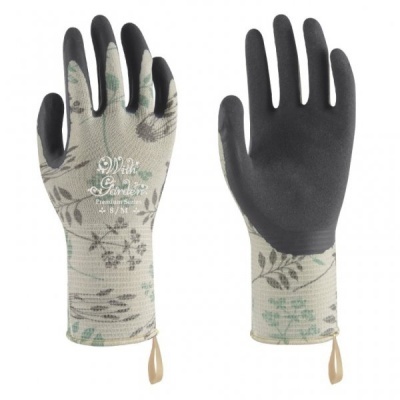 The WithGarden Luminus 507 Gloves are available in three sizes to fit most hands. Please measure the circumference of your hand around the knuckles (excluding your thumb) with your palm open and your fingers together. Next, measure the length of your hand from the tip of your middle finger to your wrist.